Keep muscles strong with a good supply of nutrients including potassium, magnesium & minerals that promote restorative relaxation and help with cramping. Healthy muscles matter. Taking care of them will strengthen and support your body, so you can enjoy healthy activity and restorative relaxation. To keep muscles strong, they need a good supply of nutrients that help them contract and relax – nutrients that are not always well supplied in a typical American diet. Sodium and calcium are necessary for muscle contraction, and potassium and magnesium are required for muscle relaxation. 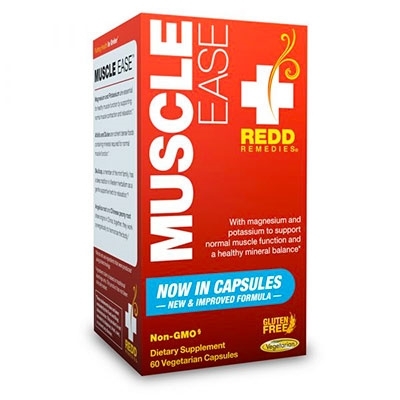 Muscle Ease™ also delivers potassium citrate, along with a trace mineral blend supplied by organic alfalfa and organic dulse – whole foods from land and sea. Herbs from Chinese and Eclectic traditions are included to support healthy muscle function and calm and renew the nervous system – which is important, as muscle contractions begin with a signal from the nervous system. Muscle Ease™ helps you achieve healthy muscle function with a simple, two-capsules-a-day delivery of natural nutrients. Muscle Ease™ is a magnesium-based formula that supports healthy muscle function, providing essential minerals and herbs to maintain proper muscle function. The whole food nutrients in alfalfa and dulse promote overall mineral balance. Both provide magnesium, potassium, iron and other micronutrients that support muscle cells naturally. They are also high in protein and deliver many essential vitamins. Alfalfa contains iron, calcium, biotin and folic acid; dulse provides organic iodine and sodium.